The Goose Guardian product introduces new goose repellent technology to solve a problem that up until now had no known solution. By incorporating a fundamental animal behavioral modification technique, the Goose Guardian is able to deter, scare, and remove Canada geese from your property in a permanent manner by "training" them to go somewhere else. The Goose Guardian is the first commercially available product to deliver a "demand performance" capability and make use of long understood animal management techniques to control and manage nuisance wildlife. As a first of its kind product, TKO Enterprises understands the need to demonstrate the effectiveness of the Goose Guardian to give customers the confidence to purchase the product. 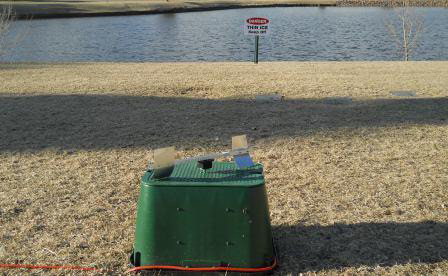 The scientific testing performed at the USDA/APHIS National Wildlife Research Center proves the Goose Guardian's effectiveness under controlled conditions. It is also important to demonstrate the effectiveness in the field, so TKO Enterprises has conducted several Case Studies and will continue to document future success stories. Please take a moment to review the currently available Case Studies, which will satisfy your questions about this revolutionary Canadian geese control product, the Goose Guardian.